Partnering with EcoAdapt and Island Press, Blue Raster has developed a revolutionary online platform using ArcGIS Online and Drupal (open source CMS) with custom modules, which will be used for cross-sector and cross disciplinary information sharing on climate adaptation strategies. Since climate adaptation is an emerging field, no source exists as a single clearinghouse of information, and the Climate Change Adaptation Knowledge Exchange (CAKE) aspires to be this vital resource for scientists, NGOs and policy-makers encouraging the adoption and evolution of policy, science and management approaches to climate change adaptation. In addition to being a vital source of information, CAKE features a forum for managers, scientists, advocates, and educators to connect with one another and share knowledge and strategies. 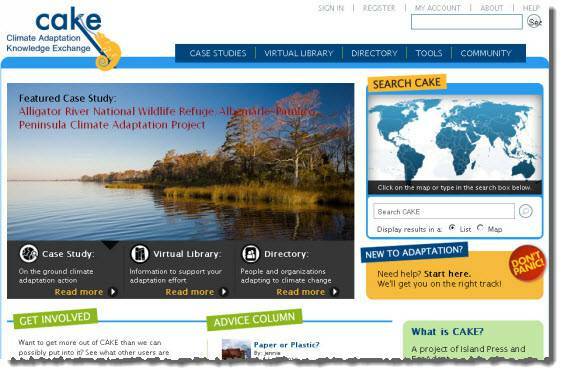 For more information regarding Climate Adaptation Knowledge Environment please visit http://cakex.org.